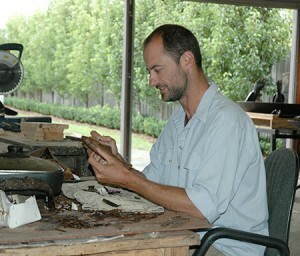 Will was brought up on a farm in Western Victoria and studied at University in Queensland and at Agricultural College west of Sydney before pursuing his passion for wildlife. He spent time working in National Parks in Northern Australia followed by work on a private game reserve in Africa. After travelling Will was inspired to start Willie Wildlife Sculptures in 2001 with the mission of making quality sculptures for people to enjoy. The Hive Gallery owes its quality, style and functionality to Karen’s personal dedication and attention to detail. She has a long held love of art and architecture, and a deep appreciation for craftsmanship and work that has a timeless sensibility. 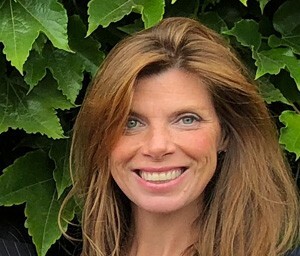 Karen is driven to develop an art gallery that exposes the diverse and extraordinary talents of local artists in a beautiful, welcoming environment. Kirsty has always pursued experiences that have allowed her to live her life creatively and within The Arts. 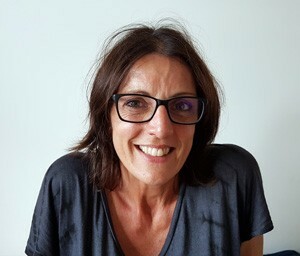 She has lived and worked in Sydney, New York, Melbourne, and also throughout Regional Victoria. She has experienced a variety of roles with a theatre company to being Brand Ambassador for a fashion brand. Kirsty is an artist at heart and joined us in 2017 to help organize events and assist at The Hive Gallery. Willie Wildlife Sculptures would like to acknowledge and thank those people in the Australian foundries for their enormous contribution towards the finished pieces. The depth of their knowledge, the range of their skills and the high level of their workmanship is truly exceptional, ensuring the excellent quality of Willie Wildlife Sculptures. They are a vital part of our team. The inspiration for the sculptures comes from fun experiences in Australia and other cultures as well as being around wildlife. All the sculptures have a sense of fun and aim to make people smile whenever they see them. They are designed to add love, charm, character, strength, and style to a garden space. Everyone can relate to the sculptures from children right through to the elderly no matter where in the world they live. Willie Wildlife Sculptures can cross all cultures the same way music and dance can. We hope you are inspired and become as passionate about Willie Wildlife Sculptures as we are. Willie Wildlife Sculptures only deal directly with clients and not through any Galleries or shops so you can discuss designs directly with the artist. Willie Wildlife Sculptures is a world leader in both design and innovation and the business continues to evolve and strive for excellence. 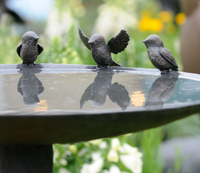 Birdbaths are one of our specialties and are designed to look superb viewed from any angle in the garden.